July 28 — A farewell party in Reusel at which twenty were present. All Dutch but myself. We had a grand time leaving another wonderful memory of Holland. 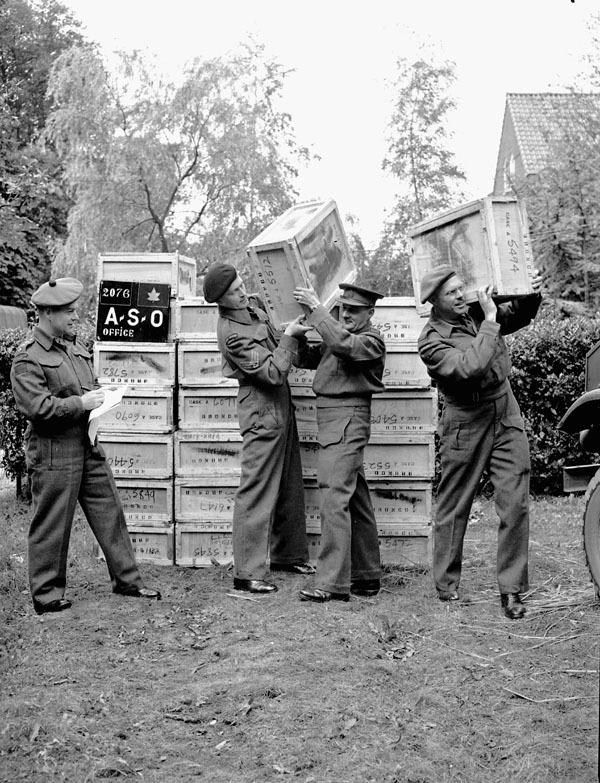 Delivery of 500,000 free cigarettes from the Overseas Tobacco League to the 5th Canadian Armoured Division, Groningen, Netherlands, 3 July 1945. LAC. July 19 — We moved from Enschede to Apeldoorn or rather through Apeldoorn on the Arnhem road to a very large Catholic Hospital and School. We will run sort of a transient place for Officers and men of the RCAMC awaiting draft. I have no function at all now, so am doing a little swearing. July 20 — Visited Army today — no information, but told to just play around until my name was called, then went to 2nd CCS and saw Archie Hardyment and Don Millose. After supper, Gordie, fred and I started for Zielst, arrived there about 9 P.M. I took two little Spaniel pups with me and gave them to the family. They named them Major and Fred. 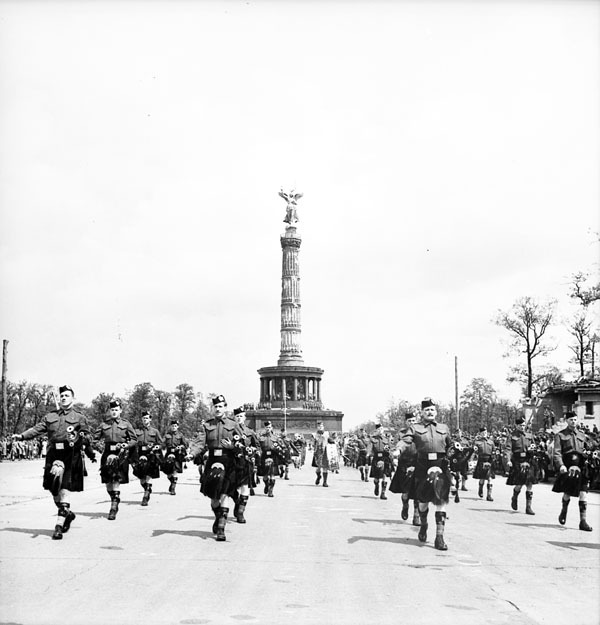 Canadian Berlin Battalion march past during a flag raising ceremony, Berlin, Germany, 20 July 1945. LAC. July 21 — We had a party — all the old friends of last winter were present and we had a grand time. July 22 — In the evening we went over to Multoven for awhile. July 23 — We started back home. When we arrived here, found no word at all. If no more word, we will go back to Zielst again. If it weren’t for my Dutch home, I would go absolutely crazy sticking around. July 25 — Another birthday. Am going out to dinner with Freddie Jenner, Clint Richardson and Timmy Cameron tonight. Fred leaves for Canada in two or three days time. Just learned today that I will definitely not go back for another six weeks. Am going to have to take over this Unit again as O.C. I am pretty well browned off, but can do nothing about it. July 26 — Last night Timmy Cameron called for me and we went out to the Brass Hat Club for a farewell dinner to Freddie Jenner. Stoney Richardson was there and we had a grand time. Today just got orders that I am leaving for Canada on Monday. July 27 — Timmy called for me and we drove out to Lochem for a farewell for Freddie Jenner, who is leaving for Canada tomorrow morning. Gordie, Fred and I returned to Zielst today. Spent a quiet day at home. A party tomorrow night in Reusel on the Belgium Frontier. July 9 – At 1 P.M. we loaded on board a Channel steamer and sailed at 2 P.M. – landing at Dover at 7:30 P.M. Had supper and were driven out to the barracks for the night. July 10 – Breakfast at 6:45 A.M. and pulled out in trucks at 7:30 A.M. and drove to Dover Priory, where we caught a train for London at 9 A.M. CMHQ ordered that we all would proceed to Basingstoke to sign in, but we all protested, so on arrival at Victoria Station where we were met by an Officer from CMHQ who released us. No hotels were available but fortunately we got a room in the Legion Club – good room, good meals and cheap. July 11 – Went to Worthing and spent the day with Spofforths. Mrs. Spofforth pressed my serge and sewed ribbons on for me. At 9 P.M. I left again for London. She and Michael will be my guests at Buckingham Palace tomorrow, after which we will go to lunch somewhere. 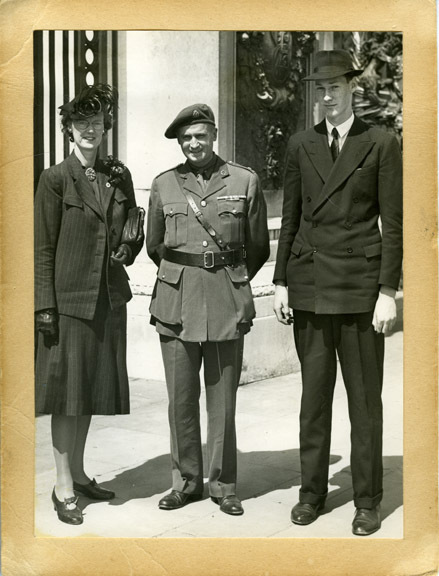 Mrs. Spofforth, Doc Alexander and Michael Spofforth at Buckingham Palace during Alex’s investiture ceremony July 11, 1945. July 12 – Just usual routine around London. In the evening Ken Clarke and I went to the Palace Theatre to see “Gay Rosalinda”. July 13 – Arrived at Buckingham Palace at 10 A.M. and met several of the old boys. After the Investiture, Freddie Jenner, Timmy Cameron, Ken Clarke and I, all from Alberta, were photographed in a group. I had been able to get a ticket for Stephens from Calgary Post Office, who is just over from Canada and whom I had run across at the Club the day before. Mrs. Spofforth and Michael were there as my guests, but of course I did not see them until it was all over. We went to the Grosvenor for lunch – after which Michael went back to work and I went around shopping with Mona until she caught the train home at 4:25 P.M. I then came home had a sleep, and now we are all packed , waiting to catch a train for Dover at 7:20 P.M. We should be back in Holland at our Units on Sunday night. Hope the trip back will be better than the trip over was. July 14 – Ken Clarke and I went to Dover last night and stayed at a barracks there. This morning we got up at 5 A.M. and caught a Channel boat at 7 A.M. Arrived in Calais at 8:30 and marched to a Reception Camp where we spent the day and caught a train at 6:05 P.M. Passed through St. Omer, Hazebrouck, Armentieres, Brussels, Tilburg, ‘s-Hertogenbosch, and arrived at Nijmegen on Sunday July 15 at 7 A.M.
July 15 – saw Dan Ellingson here today, played a few games of crib with him. My car arrived at 4 P.M. and I was back at 21 FDS in Enschede at 6:30 P.M. No further word of draft. We have admitting patients and are now told that we break up around Aug. 1. – very hot here now. July 16 – Gordie, Rudie, Addie and drove down to Lochen and borrowed a jeep from Freddie Jenner for a few days. Saw Archie Hardyment while there. July 17 – Gordie, Rudie and I drove to Utrecht to try and find Ed Brown. Could find no trace of him so went on down to Doorn and visited Doorn Castle where the Kaiser spent his time after the last war. It is very beautiful around there but the castle is not imposing. He may have chopped a lot of wood, but there is a lot standing yet. On arrival home we learn we are to move day after tomorrow to Appeldoorn. July 2 – Gordie and I drove down to Army Troops for a meeting with Col. Wood. After this we drove on down Hoevlaken and had dinner with Hans, Paul, and Pang. Ronnie is in No. 1 Gen. Hosp. – an unfortunate affair with Mac. Mac and Major Barr were in Germany on a Recce. At dinner we heard of a very primitive Dutch island, so Tony, Hans, Paul, S/Sgt. Howell and I drove to Amsterdam, cross the Ferry Bridge and headed north through very beautiful country to Volendam on the west coast of the Zuider Zee. All fisherman folk here wore the old Dutch costume. For one hundred and fifty cigarettes we hired a fishing smack – a sail boat and sailed out on the Zuider Zee to the island of Marken about four or five miles away. Everything is here as it has been for the past two hundred years – all wear very quaint costumes, wooden shoes and live in very peculiar little houses. No islander ever marries anyone but another islander. We spent about an hour there, sailed back to the mainland, had dinner in Amsterdam and then home. July 3 – Everybody busy getting ready for an inspection. Paul Laird from Sigs dropped in and spent the afternoon and evening with me. We went to the Canadian show in the evening and afterwards to the Officer’s Club. No word of repat yet – but soon I hope. July 6 – Was called to Army today and informed that I would probably not go on draft for another month. Was also warned to catch the train at 8 P.M. at Njmegan on Sunday, July 8th and proceed to London for the Investiture on the 13th. I dread the trip. Will start back on the 14th and arrive in Nijmegan the night of the 15th. Will not have very much time in England only to get my clothes ready for the affair and then start back. On the way back from Army I arranged with 2 CCS to keep Fred until I leave for Canada. I then went to 3 VSTU and arranged to keep Gordie until I leave. So if I have to stay here one month – I will still have both my batman and my driver. July 8 – My jeep was stolen last night – so I had to get the Unit HUP to drive me down to the train. Arrived at Nijmegen at 4 p.m. and met Ken Clarke from Calgary, and we will be going together. At 8:20 P.M. we pulled out on a horrible train. Two Officers whom I personally knew the in the Ontario’s and an Officer from the Sask. L.I. shared a compartment with us. We went through ‘s-Hertogenbasch, and Breda, Ghent, Antwerp, Brugge and arrived at Ostend at 3:30 A.M., to a transient Camp opposite our old stand. June 28 — Capt. Bill Butler, Gordie and I drove down to Apeldoorn to Army Troops. Had lunch with Bill O’Neil and settled a few minor questions. No word of my draft yet. No sign of Ronnie, Mac or Hans yet either. Perhaps they will come this evening. Am very anxious to know where Ronnie and Hans are being sent. June 29 — Nothing of interest. This afternoon I went over to Almelo and visited No. 6 CCS. They are located in the hospital where we had an ASC during the 4th Div. advance. I guess Ronnie and Hans must have been posted to another unit as they did not come up on Thursday. No word on draft yet. June 30 — The last day of June and nothing new at all. Went over to the Officer’s Club tonight for awhile. Will now do a little reading. July 1 — Nothing to report today. Cold and wet. Have been reading and writing all day.